Montana State University's Center for Biofilm Engineering has been a world leader in biofilm research for more than 25 years. A prestigious 11-year National Science Foundation Engineering Research Center grant awarded in 1990 paved the way for the CBE's influence in the emerging field of biofilm research. The Center's three-fold emphasis in research, education, and industry continues to produce results and exciting opportunities for students, staff, and faculty—as well as industrial partners. The mission of the Center for Biofilm Engineering is to advance the basic knowledge, technology, and education required to understand, control and exploit biofilm processes. 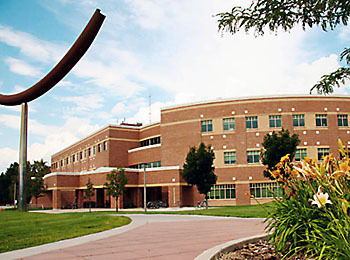 Montana State University has provided a supportive environment and a central location for the CBE's laboratories and offices in Barnard Hall. In turn, the CBE's focus on mentoring students provides them with the type of hands-on learning, participation in leading research, and interaction with world-class scholars that represent MSU's core values. In the years since the end of the NSF-ERC grant, the CBE has relied on three main sources of funding. CBE researchers continue to be awarded competitive grants from a variety of sources including DoE, EPA, NSF, NIH, NASA, INL, the State of Montana. In the 2017-18 fiscal year, the CBE brought in $7.8 million in new research funding. Additional research and testing projects are funded by private companies. The CBE's Industrial Associates program (current members list) provides key support for CBE research and operations, as well as valuable input that keeps CBE research relevant. The CBE has an extraordinary history of outstanding people working together to advance its mission. The combination of creativity, teamwork, excellence, and inclusiveness fosters the open environment that leads to shared success. This environment regularly attracts visiting researchers and collaborators from around the world.